“Ahh! Yousef. Come, come follow my voice.” Maruc led him into the stairwell that seemed to be beyond the ward engulfing the room. The man revealed looked exhausted, drawn but grimly determined, resilient and noble in a homely way. Horrible welts were etched across his chest and upper arms, he walked with a limp. Maruc appraised his wounds, severe but not life threatening. “Sorry,” Miklos said shortly and stood back to let the rogue do his work. He realized he was tapping his foot impatiently, and stopped himself. Steeling himself for the assault, the dwarf hefted his axe and charged where he believed the minotaur to be. He let out a loud dwarven bellow as he swung overhead. He hoped his strike would hit but if nothing else it should distract the beast long enough for hopefully one of Stephan’s attacks to make it through. Thunk! Stephan felt the satisfying plunge of his blade deep into what must be the minotaur’s torso. The beast turned his attention to the human warrior. Enraged by its wound, it brought its sword and struck Stephan with such force that it knocked him off his feet. Stephan rose back up quickly. The minotaur was once again attacking Feldard. With the beast now positioned between the two warriors, they could now triangulate their attacks. 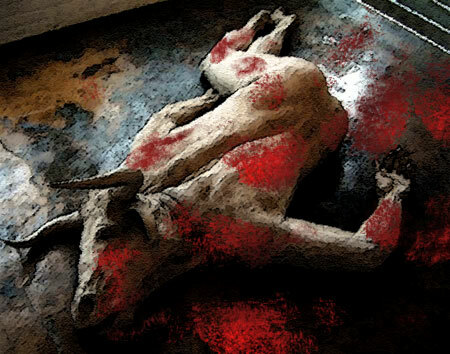 With axe and sword, they struck at the minotaur, and a sickening, grating bellow erupted in the invisible room. The creature could be heard staggering and soon fell with a thwack on the flagstones. It rolled about and Stephan joined what he believed to be Feldard in slaughtering the downed beast. In its death throes, it flopped part way out of the invisible room, giving those on the outside what must be a strange and horrific sight. “Yousef!”, Stephan exclaimed when he finally had a chance. “Halav works in strange ways, indeed!” He clasped the fellow Dymrakian in a man hug smiling despite the party’s predicament. Meanwhile, Stephan was about to join the others when he heard a loud thud, the sound of armor crashing onto the floor. The dwarf had succumbed to his wounds, falling into a heap on the floor. “Fogive me Yousef. Stay here.” Maruc turned into the room. He swiftly located the sound os scraping armour on stone. He reached out and grabbed a facid muscular arm. “Peace Stephan, I have him. You must go and give what aid you can to Miklos and Ludo. I fear they are in great danger. Leave him with me. I shall do what I can.” Stefan started to protest. Maruc heaved the bulk of the dwarf to the landing. As the enchantment left him her appeared. A great wrent in his breastplate spoke volumes of the titanic battle he had fought. Maruc pulled Feldards eyelids open, they were dilating. Maruc felt a sinking feeling, one hour? Two at most, but the dwarf was a strudy creature – he doubted he’d make four hours though. That was what Maruc needed to make the proper preparations. The dwarf was going to need more help that he had to offer. “Foolish Dwarf. Why so keen to die?” He hefted the bulky body to one side and frantically pulled at the straps. He cast the plate away and rested Feldard on his back. He shrugged off his back pack and hunted for a moment, an old tunic would have to do. He tore a wide strip from it and bound the seeping chest wound. A welt was forming in his abdomen. Internal bleeding. The tattered leg wound would have to wait. He bound upper part of the chest slash and gatherd his sewing needle and thread and sewed it shut as best he could. “That’ll leave a fine scar my friend. ” he said, ‘I hope’ he added to himself. The dwarf stared vacantly at him in reply. Maruc did not despair. He covered Feldard with his blanket and collected his small incense burner he used for his meditation rituals. He lit it and set it at the dwarf’s head. He dahbbed some of his precious holy water across his brow and sat cross legged next to his friend. He remaind motionless, and waited for his God to answer. Seeing Yousef, “Godsspeed, my friend! We will drink again in the Halls of Hokol and Sukiskyn!” He raced up the steps to join the others in the pursuit. Ludo waited at the top of the steps for the others to catch up. He was worried, the escaping mage had a decent head start and the time to prepare a nasty surprise for any pursures. Still if this evil was to come to an end, something had to be done. Holding his breath he willed his heart to stop pounding and listened for Miklos and the others coming up the stairs. Ludo decided to chance it and opened the door at the top of the stairs. He then took a quick glance around the edge of the door to check out the room using the door to shield him from an attack. Hasan followed the sound of the Stephan and Maruc’s voices, though the awful maze. When he finally emerged, he was stunned to see Feldard fallen, with funeral bier already upon his breast. “NO,” the elf sobbed, “the was a good man. Stupid and dwarfish to his core, but good as well.” The elf put his hands gently on the elf’s brow and prayed to his own god, Ilsundral — all the while acutely aware of the great mystery that he, an Elyan, would feel so strongly about any outlander, but especially a dwarf.